Alcatel 1X Evolve was recently launched and it is offered through Metro by T-Mobile (MetroPCS was recently rebranded). It is the second edition of Alcatel 1X which was released a few months ago and sold unlocked through retail stores and Amazon. Unlike the Alcatel 1X, the Alcatel 1X Evolve won’t be using the Android Go Edition operating system. The Android Go is an optimized operating system created for budget phones with less than 1GB of RAM. Phones with 1GB (or less) RAM would normally lag with heavy usage from social media or gaming apps. But with an Android Go operating system, the phone can use lite versions of apps that were customized for the Android Go OS, like Facebook Lite, Gmail Go, Google Maps Go, etc. Nonetheless, the Alcatel 1X Evolve’s speed and performance is not at all bad. It’s still sporting 2GB of RAM which we think is fair enough for a phone with a sub $100 price tag. At a glance, Alcatel 1X Evolve is a basic phone that offers basic features and use. It has a premium-looking suede finish, but it’s only offered in color Blue with its current carrier. Related: How to use the MetroPCS device unlock app. This budget phone only retails at $109 when you buy it outright from Metro, and for the price, it’s well worth it. It has the typical 2016 look; fingerprint sensors at the back below the rear camera, a premium suede finish, and a boxy but not too bulky frame. It is arguably light and not too heavy to hold comfortably with one hand. It has bezels on all 4 sides of the screen, but it has a 5.3 inches full view display in an 18:9 aspect ratio. It has a blue suede finish on a durable 2D Dragontrail™ Glass. Alcatel assures their users that the phone can withstand scrapes and scratches because of it’s durable Dragontrail glass cover. The fingerprint sensor which is conveniently located at the back also serves other purposes apart from unlocking the phone. You can assign other fingerprints to quickly launch your most used or important apps. The phone has a sizable battery which is 2460mAh and can have 14 hours of talk time (based on a 3G network). Want to use your Alcatel 1X Evolve with another carrier? Unlockbase can help you! This budget beauty is fast, considering its price tag. As mentioned, it is running on Android Oreo on a Quad-core processor with up-to 1.1GHz in speed. The camera is the usual so-so cameras you get from budget phones. The rear camera is 8MP and the front camera is 5MP. And yes, it comes with camera features but they are not as great as your $300 mid-range phones. 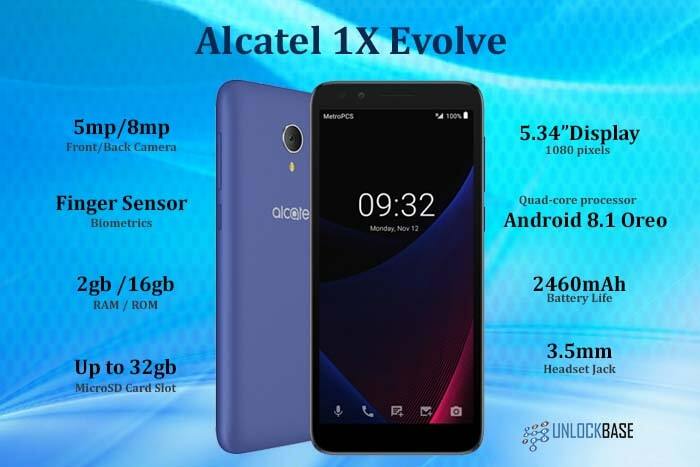 Alcatel 1X Evolve is the third Go Alcatel variant to be released within this year; the other two variants were Alcatel 1X and Alcatel 1, the latter was released in Russia. But among the three, the 1X Evolve has the best and most sophisticated features. On the other hand, compared to its other budget phone competition, the 1X Evolve does not particularly possess a feature that makes it stand out; if there is, it would be its glass back and body frame which is way better than the plasticky finish Motorola E5 play and ZTE Avid 4 has. Related: How to resolve basic errors on your mobile device unlock app. The Alcatel 1X Evolve definitely changed the way we’ll look at budget phones again. We thought the Alcatel 7 is the best budget Alcatel yet, but it turns out we can get almost the same features with Alcatel 1X Evolve for almost half the price. With budget phones like this, midrange and flagship phone manufacturers are going to have a good run for their money.